A while ago, I wrote a blog post in which I reviewed the Soylent Cafe flavors when they first came out. And a while before that, I wrote another blog post where I reviewed the Soylent Cacao and Nectar flavors. So, today's post can be thought of as a "Part 3" of sorts. I received an email from Soylent not too long ago which announced a new Strawberry flavor coming out. 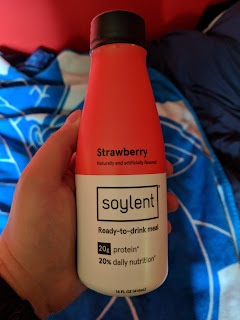 No mention of this new flavor has appeared on their blog as of this writing, because apparently I'm to be "one of the first to taste Soylent Strawberry". The email contained a promo code to get 50% off the first case when ordering a new subscription of it, and claimed it is supposed to taste just like strawberry milk. Curious, I decided to do so. My order arrived today, just a couple days after I placed it, arriving via FedEx.